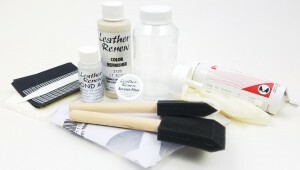 This DIY kit contains everything you need to dye leather and make minor repairs. There is enough dye to touch up two to fours seats, or dye one entire seat. Simple to use with Professional tools. Contains enough material for numerous repairs. Select from abundant automotive colors. Specially formulated for automobile interiors but works great on most smooth leathers. The dye can be rubbed on, applied with a foam brush, or sprayed on with a Preval Airspray Gun. We stay with you through the process. Click on the Color Charts button to view the color chart to determine the correct color code and color name for your vehicle.